On my touring trip to France and Spain we encountered some pretty hairy Alpine and Pyrenean descents, most notably the Col d'Aubisque. The freezing fog meant with just long fingered mountain bike gloves on, my hands practically froze to the brake levers! I've had the same experience at home though, on long winter rides; cold wet hands are both uncomfortable and pretty dangerous. As a result of this experience, and in foresight of my daily commute to Uni throughout the winter I decided a worthwhile investment would be a pair of fully wind-proof, waterproof cycling gloves. As always the criteria were good quality at a reasonable price. 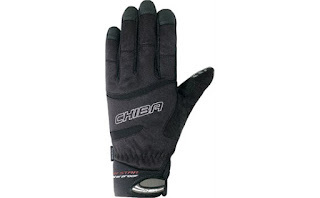 After scouring bike forums for reviews and advice, I came to the conclusion that the Chiba Drystar Gloves looked like a good bet at around £25. Over the last week or so the dramatic temperature drop has allowed me to put the Chibas into action. I'm pleased to say they are doing well. They appeared a bit bulky when they first came out of the box, but they are in fact very subtle and easy to use, even with road bike brake/gear levers. They certainly keep your hands toasty and dry as well, allowing the sweat to get out through the breathable membrane when you do really put the effort in and your hands overheat! Good breath-ability has the added benefit that the gloves actually dry out properly when they are washed as well. The build quality seems to live up to its German reputation; with stronger materials used on the palms and finger tips that get the most wear, and a useful adjustable cuff so they can be worn with a variety of sleeve types. In terms of durability I also have confidence from the fact that my touring gloves were Chiba as well, and they still looked like new at the end of 1400miles and many washes in French rivers, so I have strong hopes for the Drystars too. What more is there to say? These gloves do everything that a pair of £40 Gore Bike Wear ones would, or dare I say it a £140 Assos combo, but at a (very small) fraction of the price! I would recommend them to anyone looking for a good pair of winter training gloves or commuting gloves. They might be a bit bulky for racing, but then not many of us race in the depths of winter...thankfully! Look after your hands this winter...it makes it surprisingly more comfortable when you do. After a month of wearing these for commuting and weekend riding (getting used every day), they still appear to be going strong. The liner glove inside has come loose on one hand at the finger tips, but that's not a problem if you are careful taking them off. Nice gloves protection the biker in all seasons and save from wounds and injuries.